Athens, Ga. – Research from the University of Georgia indicates that head-starting–raising a species in captivity and releasing it into a protected habitat after it has grown large enough to be less vulnerable to predators–is a useful intervention for boosting the state's gopher tortoise population, which has been declining in numbers for decades due to predation, poaching and loss of suitable habitat. Seventy percent of head-started tortoises raised from donor eggs were still alive a year after release at Yuchi Wildlife Management Area in Burke County, according to research by Tracey Tuberville and Dan Quinn. They published their findings in the Journal of Wildlife Management. The gopher tortoise, Georgia's state reptile, is a keystone species whose burrows provide shelter for more than 250 other species, said Tuberville, associate research scientist at the Savannah River Ecology Laboratory and adjunct faculty at the Warnell School of Forestry and Natural Resources. Despite predation risks at the release site, survival rates were higher than survival reported for their wild counterparts, according to Quinn, a graduate student at SREL and Warnell during the research. Quinn conducted two soft-releases of yearlings at YWMA during consecutive years. 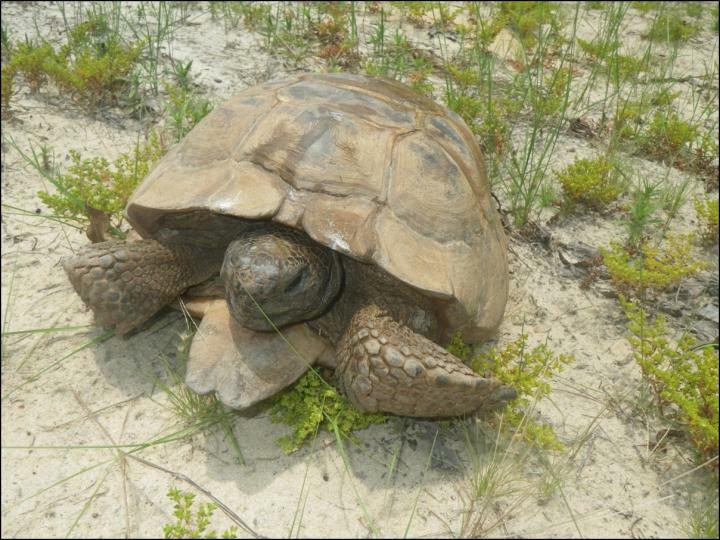 The team said the second release was the largest tortoise release in the state to date. "We initially released the tortoises into pens to acclimate them into the natural environment," he said. "This gives them time to construct a burrow and in theory it reduces predation risk." Forty-two of 145 yearlings were radio tracked and monitored for a year following the soft releases, providing information to inform future head-starting efforts. Tracking data revealed that the juveniles demonstrated a strong rate of site fidelity, remaining together in a protected area, which allows them to reproduce. This means the soft-release technique is not necessary, according to Tuberville. Instead, the researchers will implement multiple releases in various locations to help reduce predation risk. Predators included fire ants, raccoons and dogs, with fire ants accounting for the majority of fatalities. Head-starting efforts at YWMA will continue with tortoises that are 2 to 3 years old, an age when they are less susceptible to predators, Tuberville said. Additional research will evaluate whether the positive effect on post-release survival warrants the additional time in captivity. Co-authors on the study include Kurt Buhlmann, University of Georgia, Savannah River Ecology Laboratory, Aiken, South Carolina; John B. Jenson, Georgia Department of Natural Resources, Wildlife Resources Division, Forsyth, Georgia; and Terry M. Norton, St. Catherines Island Foundation, Midway, Georgia.